Yes, I usually keep the gears of this blog machine oiled with the grease of vanilla-scented non-denominationalness. 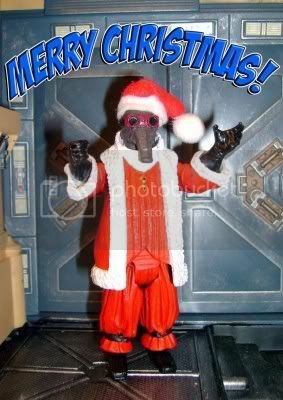 But I couldn’t resist posting this image of Santa Baz the Christmas Kubaz* when I came across it in a (regrettably) now-concluded Ebay auction. I’m all for wishing my fellow members of The Tribe a Happy Hanukkah, too, but I couldn’t find a picture of Admiral Ackbar in a yarmulke. Anyway, I hope everybody enjoys the holidays. Thanks for being such a swell group of readers. * Huge Star Wars geek points for you if you not only recognize the Kubaz species from Episode IV, but also can do a spot-on Kubaz impression. Merry Christmas right back atcha :) Hope you got a lot of geeky things.